What Cheer Airport – Pawtucket, R.I.
What Cheer Airport was one of Rhode Island’s early airfields that was in operation from the mid 1920s to 1934. It began as a small grass airfield located on a few acres of land between Manton Street, Newport Avenue, and Beverage Hill Avenue in Pawtucket, close to the East Providence city line, but it eventually grew to encompass over 300 acres and extended into East Providence as far south as Ferris Avenue. The name “What Cheer” comes from the legendary greeting of “What Cheer, netop?” which the Narragansett Indians are said to have given Roger Williams, (Rhode Island’s founder), upon his arrival in 1636 at what would become Providence. (“Netop” is the Narragansett word for friend.) The words “What Cheer” are also found on the Providence city seal. The land on which the airfield sat was owned by Nicholas Bertozzi, and was initially used by the Curtis Flying Service. On May 21, 1928, Bertozzi, along with Leo J. Leeburn, and Attorney Raymond J. McMahon, were granted a charter by Secretary of State Ernest L. Sprague to incorporate What Cheer Airways. The corporation began with $10,000 in preferred stock, and 500 shares of common stock. The Charter enabled What Cheer Airways expand the airfield and establish passenger flights, as well as institute a flight school and airplane dealership. The planned expansion would grow to encompass 85 acres, and would include the erection of six airplane hangers, and the construction of two runways, one about 2,150 feet long, and the other about 2,500 feet long. On September 15, 1928, veteran pilot and instructor Douglas Harris took over as chief pilot and instructor for the company. Interestingly, Harris bore a remarkable resemblance to national hero Charles Lindbergh. In fact, Harris and Lindbergh were born on the same day, and Harris owned a Curtis Jenny that had once belonged to Lindbergh. By the late 1920s the state legislature had decided that there should be a state owned airport for Rhode Island. If it came to pass, it would be the first state owned airport in the United States. This airport, wherever it might be located, would become the state’s primary airport regarding passenger service and commerce. At the time there were about ten or so airports in Rhode Island, some more established than others, and each vied for consideration. In today’s world, with modern (and noisy) jet traffic, proposing to put a major airport in any community would likely meet with resistance, but this was an era before jets, when the occasional drone of an aircraft propeller was cause for one to look skyward and think of Charles Lindbergh. As such, the City of Pawtucket was anxious to have the state decide in its favor for What Cheer Airport, and formed an aviation committee within the Pawtucket Chamber of Commerce. 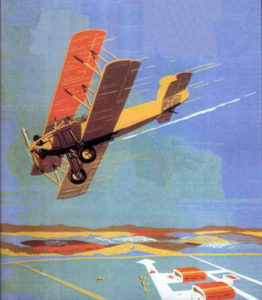 To help gain attention, in October of 1928, What Cheer Airport hosted what was advertised as Rhode Island’s “first military air meet”, and “the most spectacular military air meet in New England’s history”. Pilots of the Rhode Island National Guard, as well as military flyers from New York, Boston, Hartford, and Virginia, arrived in various types of aircraft. One plane of particular interest was a Fairchild Monoplane which had wings that could fold “like a bird” to make it easier to store in a hangar. A total of 40 military planes were in attendance. However, many civilian aircraft were also in attendance, one being a large, 14 passenger all-metal, Ford tri-motor, with a wing span of 78 feet, valued at $65,000. One civilian of note was famous pioneer aviator Harry M. Jones, who arrived from Mane in his Stinson-Detroiter. Special features of the air meet included air races and stunt flying, parachute jumps, and a mock air battles. It was during this air meet that What Cheer Airport was officially dedicated by Governor Chase on Oct. 14, 1928. As part of the ceremony, the Governor released a number of “Good Luck” balloons, one of which had a small horseshoe attached. The finder would be entitled to a free plane ride. The event was highly successful, attracting 50,000 people and 15,000 automobiles to the area, which reportedly created the worst traffic jams in the city’s history. 1) What Cheer’s convenient location to the Providence metropolitan area and the “bulk of the population of Rhode Island”. 2) The great number of people who already frequent the airport. 3) The field now consisted of 292 acres, most of which was level and needed little or no grading. 4) The area had a great deal of skilled labor, including tradesmen capable of working in construction as well as the growing aircraft industry. 5) The airport already had nearby rail facilities for handling freight and passengers. 7) There were no wire hazards – meaning that there were no telephone poles to obstruct takeoffs and landings. 8) The airport was in proximity to golf courses, farm land, and Slater Memorial Park, any of which could serve as emergency landing fields. 9) The airport was only 5.2 miles from the Providence Post Office in downtown Providence, about 13 minutes away. 10) The airport would be easily accessible for those living in the Blackstone Valley region. 11) The field already possessed a six-plane hangar and administration building. 12) The airport was serviced by nearby trolley lines. 13) There was still open land around the airport which would allow for future expansion. Unfortunately for Pawtucket, the state chose Hillsgrove Airfield in Warwick, which is today the state’s primary airport known as T. F. Green. Hillsgrove Airport was dedicated on July 2, 1929, and a $300,000 bond issue was passed for construction to begin. Advocates for What Cheer Airport then proposed a plan where the airport would be municipally owned by the cities of Pawtucket and East Providence, since the airport was now located in both jurisdictions. In April of 1930 another air meet was held at What Cheer featuring stunt flyers and parachute jumpers. The program also promised a first for Rhode Island – an aerial wedding between Miss Mabel P. Denver of Seekonk, Massachusetts, and Charles E. Cherry, of Pawtucket. The nuptials were to be performed aboard a Ford tri-motor aircraft by the town clerk of Rehoboth, Massachusetts, H. E. Hill. Theirs was the first wedding in Rhode Island to take place in an airplane while in flight. On May 4, 1930, it was suddenly announced by the Curtis-Wright Flying Service, the lessee of the field, that they were suspending their operations at What Cheer Airport for an “indefinite” period of time. The specific reasons were not stated. Meanwhile, the Pawtucket Chamber of Commerce pursued plans for the field to become municipally owned. Nicholas Bertozzi, the owner of the airport, and President of What Cheer Airways, said he would hold the property open for at least two years to allow the city(s) time to make a purchase. Shortly afterward the airport came under the new management of the Rhode Island Flying Service, the vice president of which was well known New England aviator Joshua Crane, Jr.
On June 28, 1930, Rhode Island aviation history moved forward when the first glider flight ever made in the state was accomplished at What Cheer Airport. The pilot was Joshua Crane, Jr., and the glider was made by Waco aircraft. It was launched into the air via a 500 foot rope towed by an automobile. Mr. Crane circled the field once at an altitude of 250 feet before landing where he started, and made a second flight a short time later. The following month the Goodyear blimp “Mayflower” visited What Cheer Airport from its regular station at Colonel Edward H. R. Green’s Airport at Round Hill in South Dartmouth, Massachusetts. The blimp had a seating capacity of four passengers and a pilot, and made numerous trips about the area giving flights to 115 people. On one flight, airport manager Arthur T. Ormaby was allowed to pilot the ship and commented that it handled smoother than an airplane. It was also in July of 1930 that members of the Providence Glider Club met at the airport to watch Thorsby P. Slack demonstrate a Waco glider. After being towed into a 10 mph breeze Slack rose to an altitude of 600 feet and made a complete circuit of the field lasting two minutes and ten seconds thereby setting what was thought to be a new glider record for Rhode Island. On October 4, 1931, it was announced that Joshua Crane, Jr., now President of Dennison Airport Incorporated, of Quincy, Massachusetts, and some unnamed associates, had taken over operations at What Cheer Airport after acquiring the lease formerly held by the Curtis-Wright Flying Service. The chief pilot for the new enterprise was to be Kurt Langborg, who had also worked as chief pilot for the now defunct Rhode Island Flying Service. In the summer of 1932, the New York Times reported that a farmer living near the airport wanted to take flying lessons, and in lieu of cash offered a milk cow as payment. Airport manager Joshua Crane Jr. accepted the offer, and agreed that that the farmer could have daily flight lessons for six weeks. The plan for What Cheer to become a municipally owned airport never came to fruition. However, in August of 1933, the possibility arose that What Cheer Airport might yet be the state’s primary airport. On August 7, Governor Theodore F. Green announced that he was willing to consider a plan submitted by the Pawtucket Businessmen’s Association to make their city the hub of Rhode Island air commerce. Governor Green had just returned from a 6,000 mile trip where he’d visited other airports and determined that all of them were in better condition than Hillsgrove Airport. Furthermore, the projected costs of new runways at Hillsgrove were estimated to be $350,000; an astronomical sum for 1933, especially during the Great Depression. It was reported that half a million dollars had already been spent on Hillsgrove, and the Governor didn’t want to “continue to throw good money after bad.” Yet this proposal put forth by the businessmen failed. History has shown that Hillsgrove remained the state’s primary airport, and as stated earlier in this article, is today known as T.F. Green Airport. The property occupied by What Cheer Airport was sold August 1, 1934, to the Narragansett Racing Association which converted it for horse racing. The Providence Journal, “Green Ready To Consider What Cheer Airport Plan”, August 8, 1933.